“The greatest service which can be rendered any country is to add a useful plant to its culture,” the third President of the United States said. In 1800, Thomas Jefferson had no idea how wrong he was. It is easy for us, here in the 21st century, to see how detrimental the blind introduction of foreign plants can be to America’s natural environment. 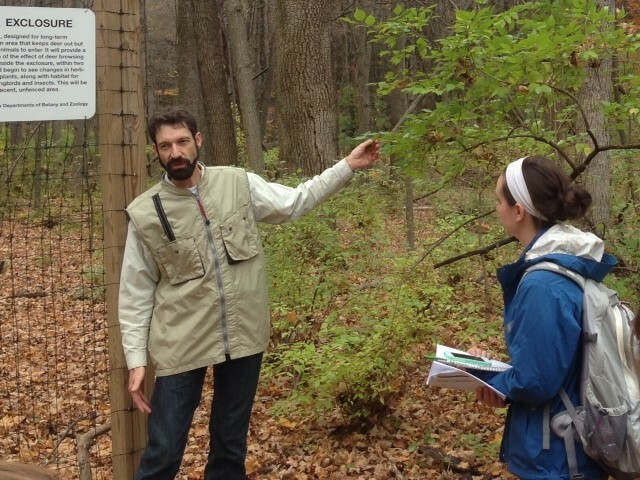 Miami University professor David Gorchov, to whom the USDA awarded a $375,000 grant in support of his research, is at the forefront of Amur honeysuckle studies. Miami professor of geography Mary Henry and Kent State biology professor Oscar Rocha were also worked with Gorchov. Gorchov’s 2004 study, “The invasive shrub, ‘Lonicera maackii,’ reduces growth and fecundity of perennial forest herbs,” explores some of the impact on native plants when a non-native species, such as “Lonicera maackii,” otherwise known as Amur honeysuckle, is introduced. In Ohio, this species of honeysuckle is especially prevalent. Miami’s Western Woods are a prime example of the ways in which honeysuckle can take over. “It is able to photosynthesize in the fall and even more so in the spring,” Gorchov said, standing in one of the Western Woods trails behind Peabody Hall. In other words, Amur honeysuckle plants expand leaves earlier and remain green longer than most native species. In the late fall, there is little green to be found around campus. On these trails, however, there are thickets of green plants. Amur honeysuckle made the long journey from Asia’s temperate regions to eastern U.S. but, once it got here, it did not want to leave. This means, that on top of having no real predators, this honeysuckle can change its shape in response to its environment and to the amount of light it receives. It sounds like a super plant. It stays green for a long time and can easily and effectively alter in order to thrive in various environments. Amur honeysuckle sounds like the perfect ornamental plant and, for a while it was treated as such. The U.S. government, Gorchov said, even helped promote the plant, saying that it would be great for habitat restoration. However, in America, this honeysuckle is invasive and it has a way of taking over an ecosystem, strangling the growth of the native plants. Gorchov grew up loving nature in New Jersey. After a Princeton undergrad degree and a Ph.D. at University of Michigan, he landed at Miami. One of his first grad students got him interested in the study of Amur honeysuckle. Honeysuckle piqued his interest and, as is its nature, invaded his studies. He is still trying to solve the Amur honeysuckle problem, or at the least to understand it. He has advised eight Miami graduate students, and several undergraduate students, on honeysuckle projects, ranging from its impacts on wildflowers to the role of birds and deer in dispersing its seeds. Locating the honeysuckle is simple. Getting rid of it is far more difficult. If you cut it down, Gorchov said, the stumps sprout new shoots. Uproot it and other invasives will take its place and spraying herbicides has to be done carefully to avoid killing surrounding plant life. Gorchov’s current and future studies will attempt to rectify the Amur honeysuckle crisis. A lot is on the line.